Love your iPhone camera’s functionality? Do you often wish your digital camera works as good your iPhone? Well, you’re guaranteed to enjoy this new accessory – a USB cable that doubles as a mini tripod! Yes, you read that right! Since accessories for compact cameras have become popular, one has been developed specific to the iPhone to maximize its capabilities as a multimedia tool. 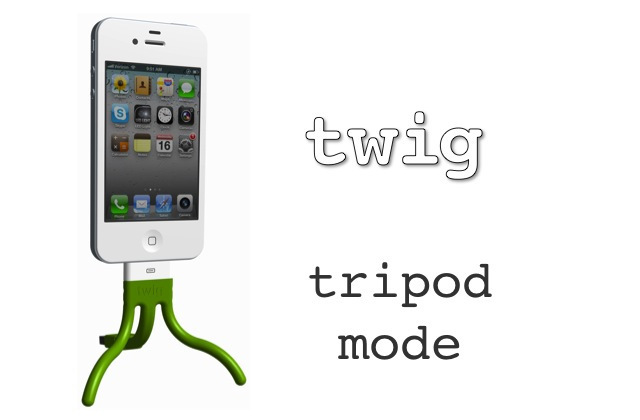 Aptly called “Twig,” the USB cable tripod was designed by Oregon-based designer Jason Hilbourne to become every iPhone user’s ultimate best friend. 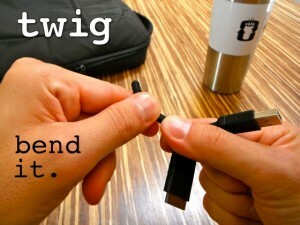 Would you believe that this tiny pocket-sized device was able to combine the great capabilities of both a USB cable? It charges and syncs your iPhone in a snap, and then as a mini-tripod, it allows for you to use Facetime, take photos, or watch videos conveniently. And did I mention that it can actually be used too to keep your earphone neatly and nicely wrapped? So say goodbye to messy and tangled earphones and say hi to never having to run out of battery charge and endless and effortless iPhone use. The two legs of the Twig can be bent and shaped according to how you need it to be. You can bend the legs in the other direction of that of the USB to turn it into a tripod for taking pictures or using Facetime. Or, you can turn the Twig sideways to act as a stand when you want to watch a video. Either way, you will be able to contort it according to the type of surface you wish to place it on, and best of all, according to your need. Although it is beyond the power of the Twig to let you charge your iPhone from across a room (not that it is important) given that it does not have the length of a standard cable, you can always buy USB extender cables to solve that. The Twig is a fun and useful accessory to take with you when you relax, study, or take trips, or even when you just lounge at home. Priced at $18, the Twig is available in red, green, blue, yellow and black. For iPhone camera fanatics, this is a definite must-have, and for those who have yet to appreciate their iPhone’s cam, this might just be the thing that would trigger that. Enjoy! 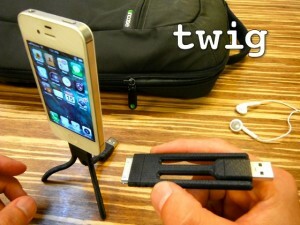 This entry was posted in iPhone and tagged flexible, iPhone, iPhone Accessory, iphone gadget, jason hilbourne, tripod, twig. Bookmark the permalink.